EARRINGS - SARAH COVENTRY. "RASPBERRY ICE" FROM 1962. 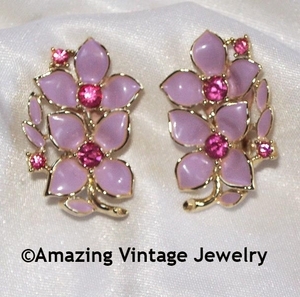 YUM YUM...BRIGHT GOLDTONE WITH PASTEL LILAC ENAMEL FLOWERS ACCENTED WITH PINK RHINESTONES. CLIP. 1 3/8" LONG, 7/8" ACROSS. VERY GOOD CONDITION WITH SOME HARD TO SEE CHIPS TO THE METAL FINISH. PRICED ACCORDINGLY.